At MIT's Laboratory for Nuclear Science, we work to understand the structures and interactions of the fundamental constituents of matter. MIT Physics Ph.D. students form the backbone of current LNS research activities worldwide. They carry out research in nuclear and particle physics, subfields that are seamlessly integrated within LNS. Their work is done with large experimental equipment located both at and away from MIT, sophisticated theoretical calculations, state-of-the-art computers, and with guidance and assistance from LNS faculty and highly skilled engineering and technical staff. LNS students are working to understand how basic properties of the proton, e.g. mass and spin, arise from quarks and gluons. This research involves high energy scattering experiments at the Thomas Jefferson National Accelerator Facility and at other accelerators, theoretical calculations, and large scale computation using the technique of lattice QCD. 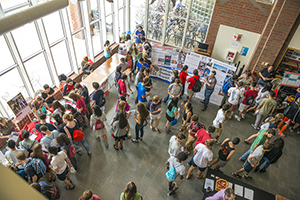 The Class of 2019 meets the MIT community during freshmen orientation. Photograph by Christopher Harting, September 2015. With the CMS detector, LNS students explore the phases of systems of quarks and gluons by creating droplets of the hottest matter anywhere in the universe (since it was a few microseconds old) in ultra-relativistic heavy ion collisions at the Large Hadron Collider at CERN in Geneva. 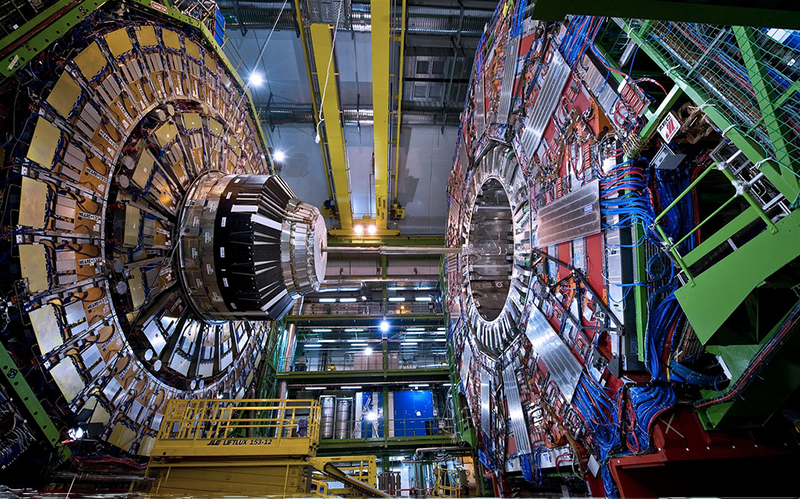 Other students use the CMS detector to study proton-proton collisions to measure the properties of the Higgs boson and search for dark matter. Also at the LHC, students use the LHCb detector to study particles containing charm and beauty quarks. LNS students are developing new theoretical approaches, built upon techniques developed in string theory, to understanding the quark-gluon plasma. They share offices with students applying string theory to questions in quantum gravity and cosmology, with students analyzing jets in proton-proton or heavy ion collisions, with students seeking to predict what Nature will serve at the LHC in addition to the Higgs, and with students devising algorithms for future quantum computers. Some LNS students are developing ingenious detectors to look for direct evidence of the dark matter that makes up 85% of the mass of the universe; others are busy analyzing data from the Alpha Magnetic Spectrometer that has been operating on the International Space Station since 2011. In particular, they are looking for evidence of dark matter particles annihilating in distant space. LNS students are working to determine the mass of the electron neutrino and to carefully measure neutrino properties, as well as participating in an experiment to determine whether a neutrino is its own antiparticle. Neutrino efforts include the development of novel high-intensity accelerators to produce neutrinos. In the area of fundamental symmetries, LNS students are attempting to measure the electric dipole moment of the neutron, which may indicate the source of the universe’s matter/anti-matter asymmetry.